My Husband is a Squash Player. For those of you who are unfamiliar, squash is a racquet sport played on an indoor court somewhat resembling racquetball, but with a harder smaller ball. A well-played professional squash game is like a ballet, with the players hitting the ball off all four walls of the small court, moving quickly from front to back and side to side, and trying to stay out of each other’s way while scoring points. I’m the world’s worst klutz, but I like to watch the pros play. A few years ago, some of the top women came to Seattle, and I was very impressed with their athleticism and grace on the court. Last evening, we were treated to an exhibition game between two of the world’s top-rated male squash players, Gregory Gaultier of France and Amr Shabana of Egypt. The match, which Shabana won, was all in good fun, and Gaultier more than once played the jester in between points. Here is a little video clip I took with my iPod Touch. 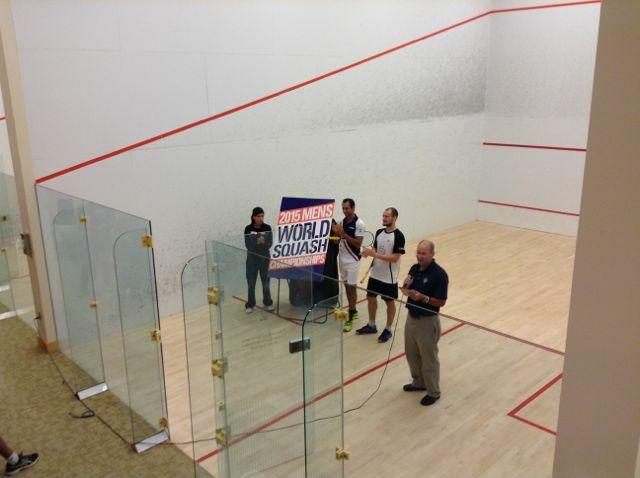 They had just participated in a big tournament in San Francisco, and they came by the Pro Sports Club in Bellevue, Washington to promote…ta da….the World Men’s Squash Championships which will be held here in November of 2015. If you’ve never watched a squash match, you haven’t seen some of the best in individual sports. Try it!